When I was caring for Mom I was used to medicine mix-ups, whether it was her home health nurse confusing what medicine Mom was currently on, or worse, nurses and doctors in the hospital accidentally giving Mom the wrong prescription (they mistook another patient’s chart for hers one time and almost gave her Ambien!). I learned to ALWAYS share with providers in detail exactly what medications Mom was taking with doses and start dates and I was always the one to administer her medicine no matter where we were, including the hospital, so I could ensure it was all correct. It came as little surprise then when recently I was helping my father get a prescription for a blood thinner from his doctor, and they prescribed something he definitely shouldn’t be taking. After an ultrasound in Dad’s leg revealed a superficial blood clot, I spoke with his doctor and they told me they had sent a prescription for Xarelto to his pharmacy. Well, a quick google search revealed that patients shouldn’t take that medicine if they have had a heart valve replacement, which Dad has and which, of course, is in his chart at the doctor’s office. I called the doctor’s office back and asked if they were concerned about his taking Xarelto since he has had a heart valve replacement and their reply was, “He has?”. 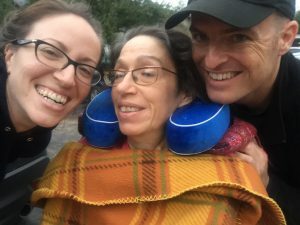 Naturally, they quickly voided that order to the pharmacy and instead prescribed a couple other medicines that would work with less risk for adverse side effects. The truth is, however, if I hadn’t have stopped and asked about it, they likely wouldn’t have caught that mistake. Did that make me angry? Not really. I’ve seen it enough to know that doctor’s offices are imperfect and mistakes can happen, a lot. That is why it is so critical for caregivers to not just care for their loved one but to advocate on behalf of them too. Advocating will largely start with asking questions, and some of the biggest most important ones will be about medicine. What does this medicine do? So your loved one is given a new prescription for an ongoing medical condition – do you know the brand name, generic name, and exactly what it does? This simple question will encourage your doctor to explain how the medicine will interact with your loved one’s system to address a problem they are having. A little more information about the medication can also reveal enlightening details about your loved one’s disease process that may help you as a caregiver. Can we simplify this medicine schedule? Making it less complex and time-consuming to stay on track of taking medicine may increase your loved one’s adherence. For example, if your loved one has to take 100mg pills three times a day, it may be worth asking if they can take 150mg twice a day instead, or 300mg at once. What side effects can we expect? Providers should always cover side effects of medications with you, even if they are printed on the prescription themselves, but you may need to ask about them. Knowing what to expect allows caregivers to keep a close eye out for any warning signs as well as ask whether any possible adverse side effects outweigh the need for the medication itself. Did you know my loved one has _______? Many seniors have multiple health providers including general practitioners and specialists which means that multiple doctors could be writing prescriptions. Even though your loved one’s doctor should have a full medical history on file, it is critical that you bring up any concerns you have about interactions. Always have a detailed and full list of all prescription and over-the-counter medicines as well as supplements your loved one takes and remind their doctor of any procedures and surgeries they have had in their lifetime. Is there a different “version” of this medicine? If your loved one experiences difficulty swallowing pills, you should definitely ask whether any of their medications come in liquid (oral suspension) form. You may be surprised how many do. Same goes for name brand medications – you could save money by asking for free samples at the doctor’s office as well as by asking for alternative medications that are just as effective but which are more likely to be covered by your loved one’s health insurance. What do we do if we take too much or too little by accident? Few things cause caregiver freak-outs like realizing your loved one missed a dose of their medicine or accidentally took an extra dose. Go ahead and check with their doctor about exactly how to proceed if either scenario happens so you are prepared and avoid unwanted trips to the ER or doctor’s office. Is there anything my loved one should avoid while taking this medicine? You may be surprised by the foods, supplements, activities, and other medicines that can interact with prescriptions. For example, I learned when my Dad was on Warfarin, a blood thinner, that consuming foods rich in Vitamin K (like dark leafy greens) could alter the results of his blood clotting tests. That was a huge part of Dad’s diet and something he had to be mindful of when he was on the medicine. You will also want to verify how medicine should be stored, when you should expect it to start working, and how long it will be needed. Reports estimate that anywhere between 80 and 90 percent of older adults take at least one prescription medication every day. If you are a family caregiver, chances are high that your loved one is on some sort of medicine. 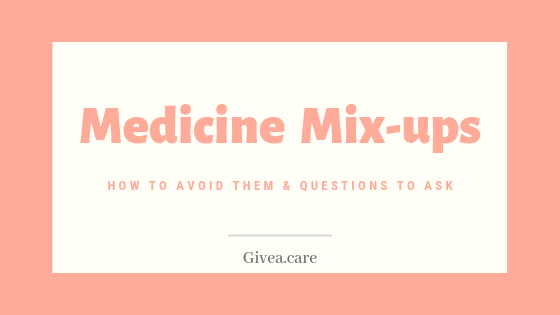 Preventing medicine mix-ups and life-threatening complications is possible but it starts with asking the right questions – don’t be afraid and keep this guide handy just in case!